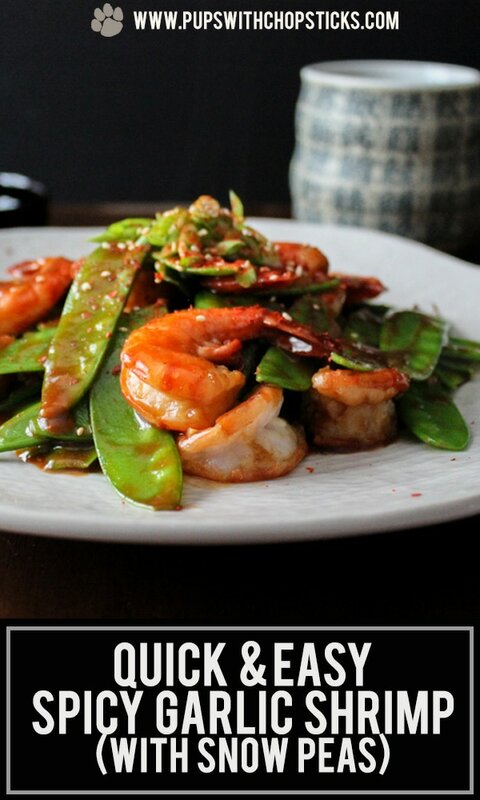 This spicy garlic shrimp and snow peas dish is quick and simple and takes literally 10-15 mins to put together. Perfect for a lazy evening. I’m terrible with eating veggies, which means I almost always never make them. I have always been a meat and potatoes kind of girl but it’s never too late to turn over a new leaf right? Baby steps. 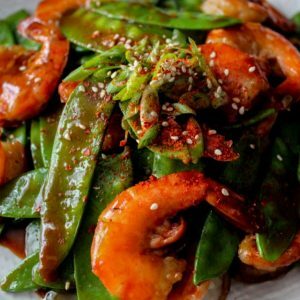 For this spicy garlic shrimp recipe, you can find almost all of these ingredients at a local supermarket. 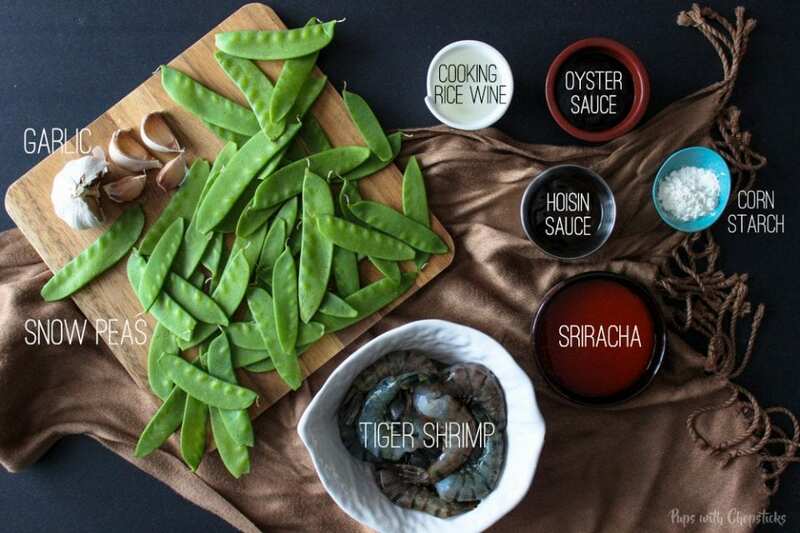 If you can’t find oyster sauce or hoisin sauce, you can definitely can find them at your local Asian supermarket. For the cooking rice wine, it can also be found at at Asian supermarket if you can’t find it at a local grocery store but to keep things simple you can substitute this with any cooking wine such as dry sherry or white wine. Peeled or unpeeled? That’s your preference! Some people enjoy it with the shells on and some find it easier to eat without the shells. I personally like using shrimp with shells on because I find the shrimp doesn’t shrink as much during cooking. To start we will pre-mix the sauce. Mix the 1 tsp of corn starch with 1 tbsp of cold water. Once it has been mixed together, add in the hoisin and the oyster sauce and combine it together and set it aside. Tip #1: When you are making a corn starch slurry, use cold water to mix your corn starch. Warm or hot water causes the corn starch to clump up and makes it very hard to mix well together, which can make your sauce clumpy when you use it to thicken it. You’re probably wondering why we had to do that extra step of mixing the water with the corn starch first and why we can’t just throw it all together at once? In this case, it is because corn starch doesn’t mix well in thick sauces directly (hoisin and oyster sauce), so we need to pre-mix the corn starch in cold water, before mixing it with the thicker sauces. 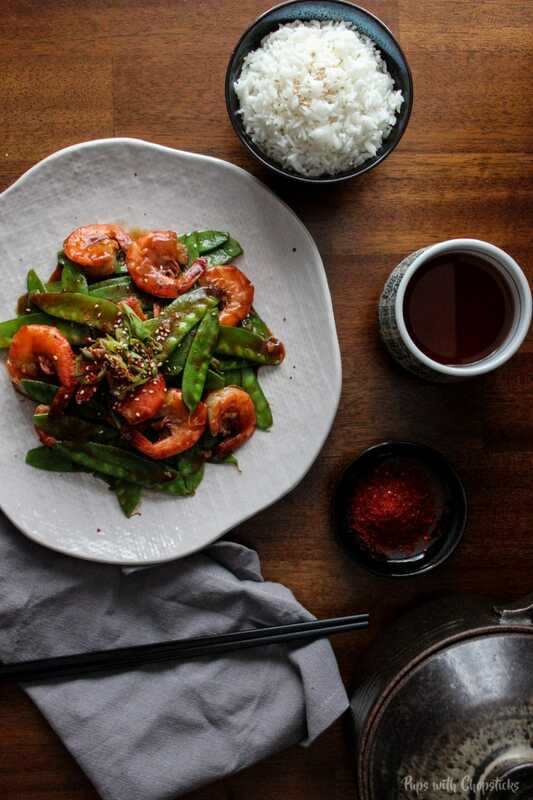 Tip #2: Snow peas only need to be cooked for a few seconds. When it turns a nice vibrant green, it maintains its crispness and crunchiness. Besides who loves soggy veggies right? 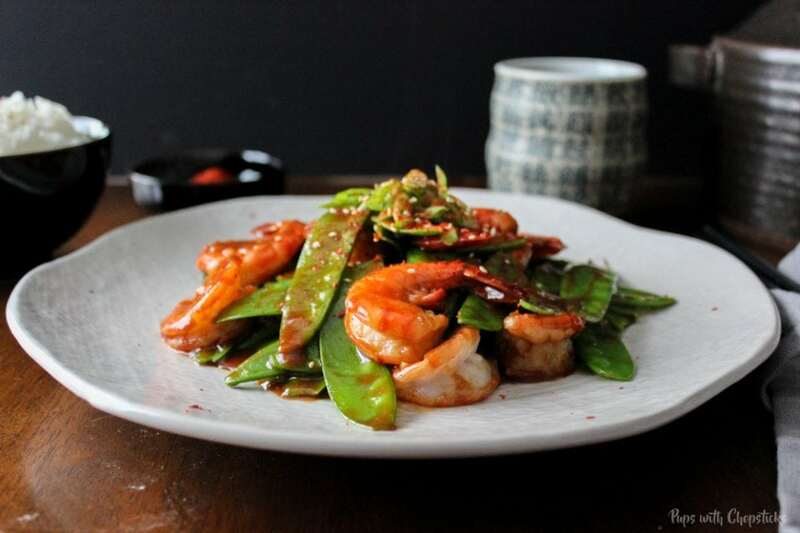 This sweet and spicy garlic shrimp and snow peas dish is quick and simple and takes literally 10-15 mins to put together. Perfect for a lazy evening. 20 shrimp (fresh or frozen) – Thaw in warm water if it is frozen. If you subscribe to my newsletter (which comes in once a week if I have a new post) then you’ll never miss a recipe! 🙂 You can use the subscribe box on the side bar on the right. 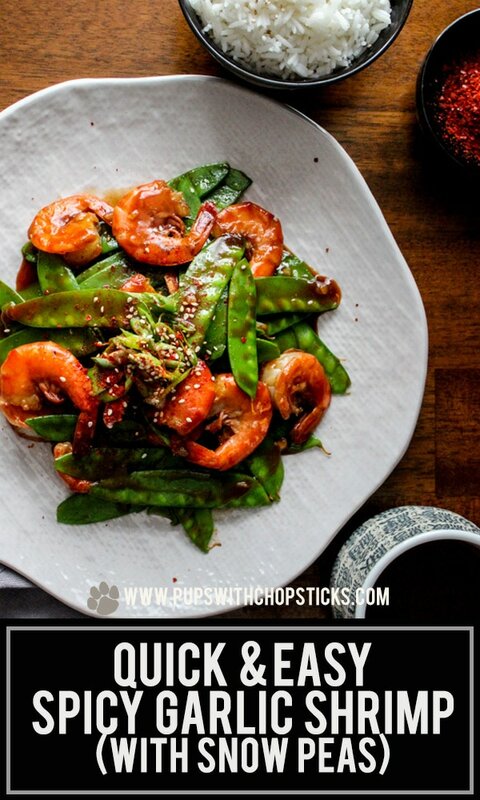 I love the bright colors in this, and the snow peas go beautifully with the spicy sweet shrimp! I love quick meals like this for weeknight dinners. It’s a great way to get kids to eat their veggies. And yes I’ve wondered about that cornstarch issue! This looks and sounds so delicious! 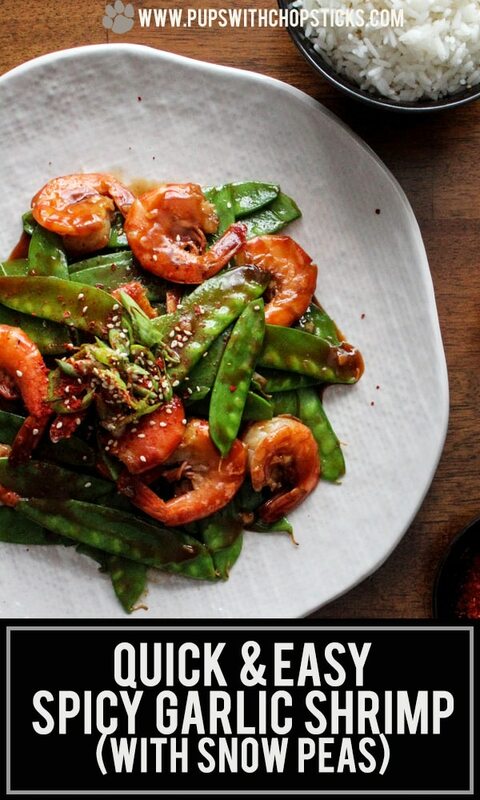 I love snow peas and shrimp! And spicy and sweet together! My perfect recipe! 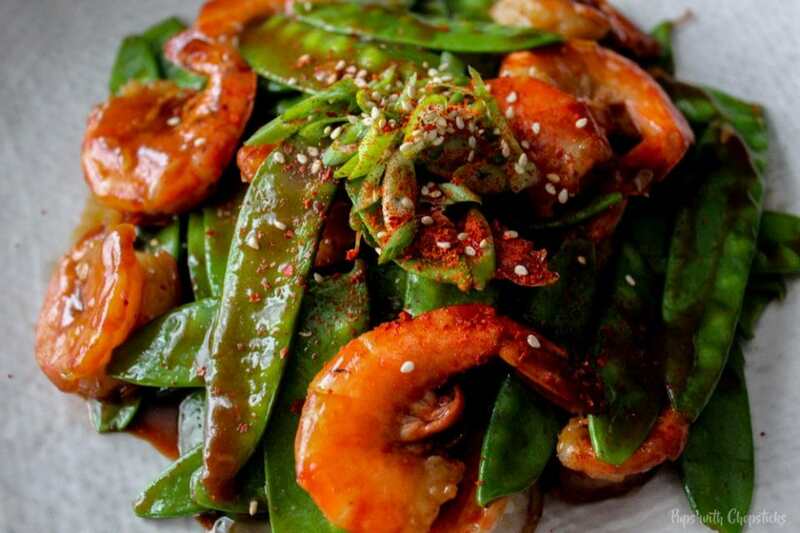 Shrimp and snow peas make such a great combo! Another delicious nice recipe for dinner (easy to cook follow your way of ingredients). Healthy dish. Will cook for my family tonight. 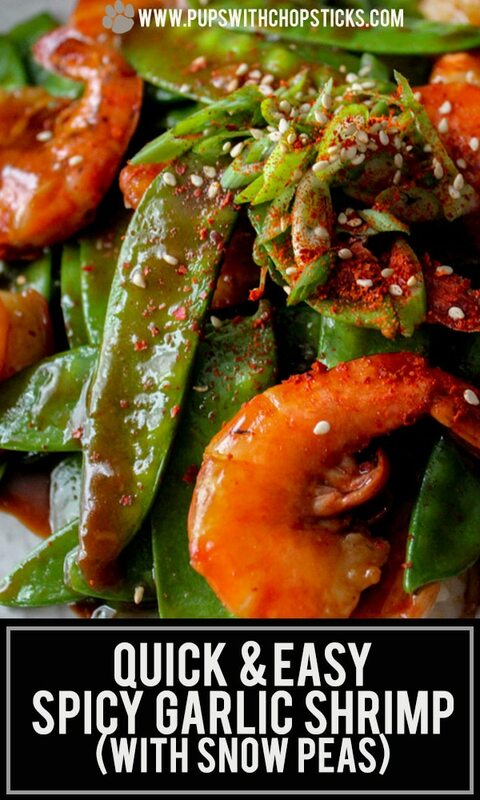 They all love shrmps and snow peas —- will say ya!! I love the way you present your ingredients for the recipe – makes the recipe more approachable. This looks amazing – I am saving this for after the holidays! This recipe looks amazing!! Love the colors in this dish! 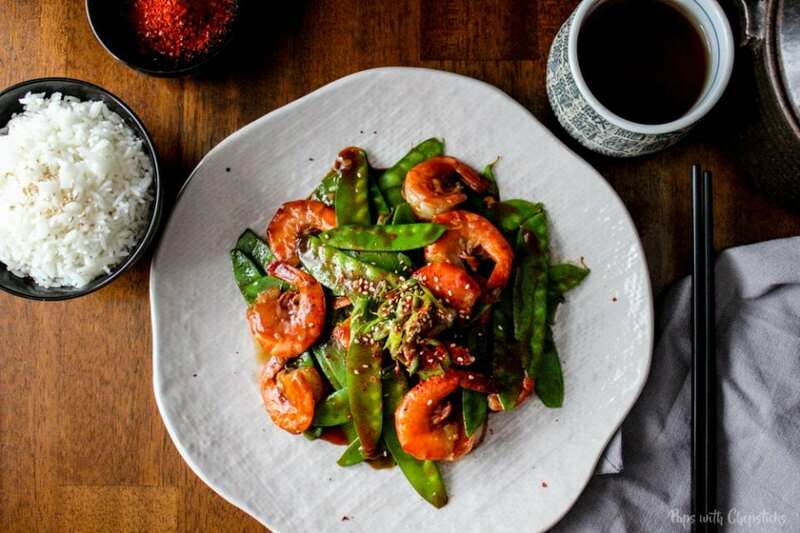 It’s so smart to do a quick stir fry on the snowpeas so they retain their crunchy texture and pretty color (I prefer my veggies raw too, so this is perfect for me)! The Forest Feast Gatherings cookbook looks amazing too– I’ll have to look into it. Thanks for sharing!